You may spy a small gray moth fluttering about the kitchen one morning or find small caterpillars wiggling about in a bag of flour. If you haven't dropped the bag in disgust, look closely: you've got pantry moths. One moth can lay as many as 400 eggs per mating cycle. Whether you call them pantry, Indian meal, flour, miller or kitchen moths, understanding the life cycle of these insect pests can help you eradicate them before they multiply. Pantry moth eggs are difficult to see with the naked eye: individual eggs are a tiny .0005 inches in diameter. Eggs are white or gray. Females lay clusters of 100 to 400 during the night, choosing areas where the newly hatched larvae can easily obtain food. Eggs hatch in four to eight days, with more larvae hatching quickly in warm temperatures. Larvae emerge from the eggs and immediately seek food in their surroundings. Newly hatched larvae resemble segmented white caterpillars with reddish-brown heads. The larvae's sole purpose is to eat, and they gorge on whatever food is at hand. 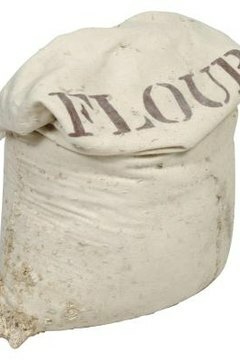 One newly hatched group of eggs can easily ruin much of a bag of flour or box of cereal as they eat and excrete waste. After about one to two weeks of feasting on your food, the larvae start wriggling out of the containers, seeking a nice dark corner of the pantry in which to rest and prepare for their debut as moths. During the pupal stage they spin silky webs, often in the cracks where two sides of a cabinet join together. They spin a cocoon and snuggle to mature into adults. If they can't escape the container in which they find themselves, they make do with what they have, and spin a web within. You may open a container to see webs on the surface; they're likely pantry moth webs. This stage lasts approximately two weeks. At the end of the pupal stage, the adult pantry moth emerges from his cocoon. He has one thing in mind: making little moths. The newly emerged adults may be tinted with shades of red or green, depending on the foods they ate throughout their life cycle. The gray-colored adult pantry moths seek mates using chemical signals called pheromones. After mating is complete, the female deposits eggs in or near a food source for the future generation, thus completing the life cycle before she dies. Four to six generations of pantry moths can inhabit a home in one year.